This series will handle Multi Leaf chains and also Duplex and Triplex chains within the tools physical limits. The 'L' tool is used by Engineers all over the World working with Multi Leaf chain. 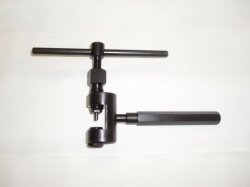 The 'XL' tool was developed to break Multi Strand chains that are beyond the 'L' tools capacity. Tool for breaking and assembling extended pin chain.